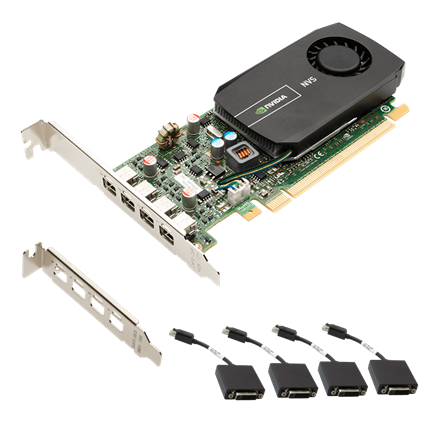 Reliably visualize any data across four displays with the power efficient, low-profile form factor NVIDIA® NVS™ 510 business graphics solution. You get support for advanced DisplayPort 1.2 features like Multi-Stream Technology and Stream Cloning, plus the capability to natively drive four ultra-high resolution displays at up to 3840 × 2160 in small form-factor systems. This configuration of the NVS 510 also includes four locking mini-DisplayPort to DVI-D SL adapters for installations requiring DVI displays or a mix of DVI and DisplayPort monitors. The NVS 510 also takes advantage of the latest NVIDIA® Kepler™ architecture with 2GB of dedicated graphics memory to deliver more than 3x the performance of the previous-generation solution-without increasing power. And it's backed by a super-reliable hardware and software platform and robust IT management tools to enable fast, cost-effective integration, deployment, and support across large enterprises. This makes it the ideal solution for today's most demanding business user. PNY provides unsurpassed service and commitment to its professional graphics customers offering: 3-Year Warranty, pre and post-sales support, dedicated Quadro Field Application Engineers and direct tech support hotlines. In addition, PNY delivers a complete solution including the appropriate adapters, cables, brackets, driver DVD and documentation to ensure a quick and successful install. Boosts productivity by delivering maximum flexibility for single and multi-display set-ups, and provides unprecedented end-user control of the desktop experience. All-new NVS 510 display engine drives up to four displays simultaneously and fully supports the next generation Display Port 1.2 standard capable of resolutions such as 3840×2160 at 60㎐. NVS 510, when used with the NVIEW Desktop Software utility, makes it easy to deploy multiple displays across a desktop or build an expansive digital signage wall. NVS 510's integrated DisplayPort 1.2 Engine produces phenomenal photorealistic image quality while driving ultra-high-resolution panels (up to 3840×2160 at 60㎐). NVS 510 also supports advanced Display Port 1.2 features like multi-stream technology (MST) and stream cloning, which enable efficient cable management. MST allows an end-user to drive up to for independent displays simultaneously from any one display port output, while stream cloning enables NVS 510 to clone up-to four instances of each display output to drive a maximum of 16 displays. End users can securelyconnect to the most exhaustive options of display monitors and HDMI capable devices either by using the included mini-DP to Display Port adapters to take advantage of widely deployed DiplayPort cables and dongles, or directly connect using mini DisplayPort based cables and dongles. Enables seamless taskbar spanning as well as transparent scaling of the desktop and applications across up to 8 displays (using two NVS 510 Graphics Cards) from a single workstation or PC while delivering full performance and image quality. Combines high-definition video processors and software that delivers unprecedented picture clarity, smooth video, accurate color, and precise image scaling for SD and HD video content. Features include, high-quality scaling, spatial temporal de-interlacing, inverse telecine and high quality dual HD video playback with low CPU utilization and power consumption. Dedicated H.264 encode engine that's independent of the 3D or compute pipeline which delivers faster than real-time performance for transcoding, video editing, and other encoding applications. Reduces visible aliasing and delivers higher image quality without the performance hit by harnessing the power of the GPU's CUDA cores and new film-style AA techniques. NVS 510's Energy Star compliant design reduces overall system energy costs by intelligently adapting the total power utilization of the graphics subsystem based on the applications being run by the end user. This power-optimized design helps reduce Total Cost of Ownership (TCO) and increase reliability. NVS 510's 2GB of dedicated memory delivers high throughput needed to drive hardware accelerated dual HD Blu-Ray video streams or interact with large textured models on up to 4 ultra-high resolution displays. The NVS 510 is the ideal graphics solution to natively drive four displays, providing the optimal balance of performance, form factor & power efficiency when compared to dual Graphics Cards configurations. NVS 510 utilizes the latest NVIDIA Kepler GPU technology to deliver over 3x greater performance and doubles the memory bandwidth for faster throughput over the previous generation NVS solutions without increasing overall power consumption. Enables data transfer rate up to 8 GT/sec per lane for an aggregate bandwidth of 32GB/sec bi-directional (16GB/sec in each direction). Compatible with x86 32 and 64-bit microprocessor architectures and operating systems from Intel/AMD and Microsoft/Linux. Dedicated NVIDIA NVS and PNY support teams for premium enterprise customers that are easily accessible to resolve their unique issues quickly. PNY offers a range of Quadro-fueled solutions ranging from multi-monitor workstation configurations to CAVE environments powered by Quadro Plex 7000 visual computing systems – in 2D or 3D stereo. Learn how Quadro visualization solutions can take virtual or augmented reality applications to the next level of capabilities and performance. Studies show that diagnostic speed and accuracy are both improved by 10- or 12-bit capable imaging solutions; this presentation recommends specific Quadro products capable of delivering 10- or 12-bit grayscale images for medical and diagnostic imaging applications. The entire design workflow is going digital – and the assets generated by this transition are now usable by marketing and sales to bring a product to market with a full array of traditional and web-based media assets. Learn how Quadro can take any Intel Core i3, i5, i7, or Xeon-based workstation to new levels of performance, interactivity, and productivity. Learn how NVIDIA Quadro graphics solutions combined with 3ds max and iray are raising the bar for 3ds Max users with features such as photorealistic iray-enabled interactive raytracing. Quadro DirectX and CUDA acceleration, in many instances augmented by multiple GPUs are defining the new edge of the 3D design or DCC workstation performance envelope. Recommended configurations for the most demanding 3ds Max user are also listed.